The room was full, the condensation was dripping as it did in those days. It was just so packed and such a small space, it was impossible to believe how many people could fit into such a small space. But Prabhupada had finished giving his lecture, “And that is Krishna consciousness. Are there any questions?” And immediately an Indian lady stood up and her question was, “Swamiji, can you see God?” It was like a challenging tone, and immediately Prabhupada replied, “Yes, you cannot?” Then he looked around the room and said, “Krishna is everywhere. You cannot see?” And there was silence, she didn’t know what to do. 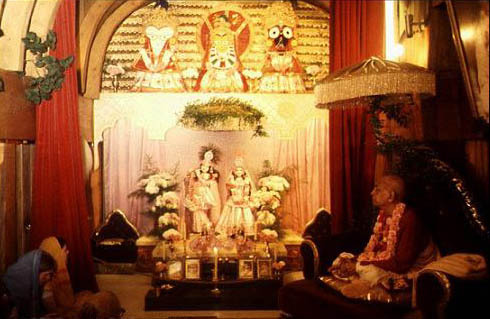 So Prabhupada said, “Why you cannot see God?” and she didn’t know what to do. Then Prabhupada said, “Do you want to see Krishna?” and the lady was getting embarrassed and she looked down and said, “No, Swamiji.” And Prabhupada immediately said, “Therefore, you cannot see."